Review – Yahari Ore no Seishun Love Come wa Machigattieru. A high school club made up of social outcasts. It’s a been there, done that concept, but this series with the verbose title provides a unique spin on the cynical high school anime experience. 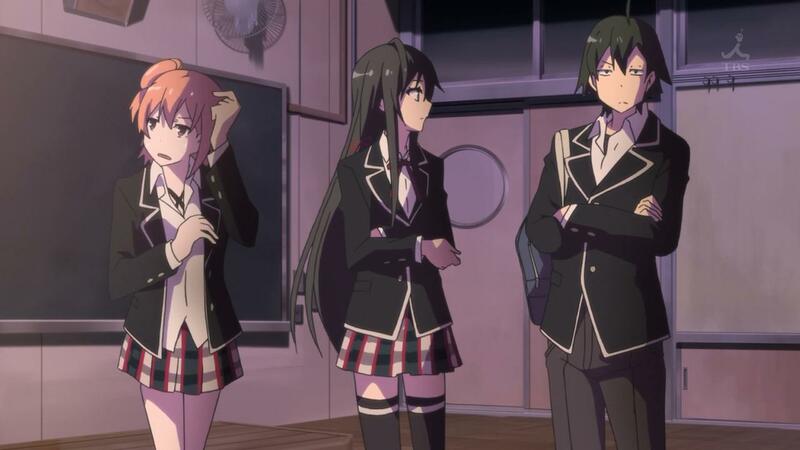 Yahari Ore no Seishun Love Come wa Machigattieru (otherwise known as “My youth teen comedy is wrong as I expected, “My Teen Romantic Comedy SNAFU, “Hamachi,” or “Oregairu”) centers around the “Volunteer Service Club,” which helps people who come to them with requests. The odd thing about the club is that it only has one member at the start of the series. The sole member is Yukino Yukinoshita (CV: Saori Hayami, as in Tsuruko from Ano Hana), a pretty girl who has grown distant from others because of how they view her. Our “hero” of this twisted fairy tale is Hachiman Hikigaya (CV: Takuya Eguchi, as in Kazuya from Gosick), whose misanthropic perspective is a byproduct of the social trauma that he’s been subjected to all his life. This causes his personality to be constantly sour, but still comical and always very ironic. The third core member of the club is Yui Yuigahama (CV: Nao Touyama, as in Kanon from The World God Only Knows 3), a ditzy but kind-hearted girl who has difficulty making good friends. Most episodes have the club solving some sort of trouble that is presented for them, all while idealism and realism clash. Hikigaya claims that the general youth populace is full of fake crap, and trouble typically arises when he has to cooperate with the societal hypocrites known as his classmates. 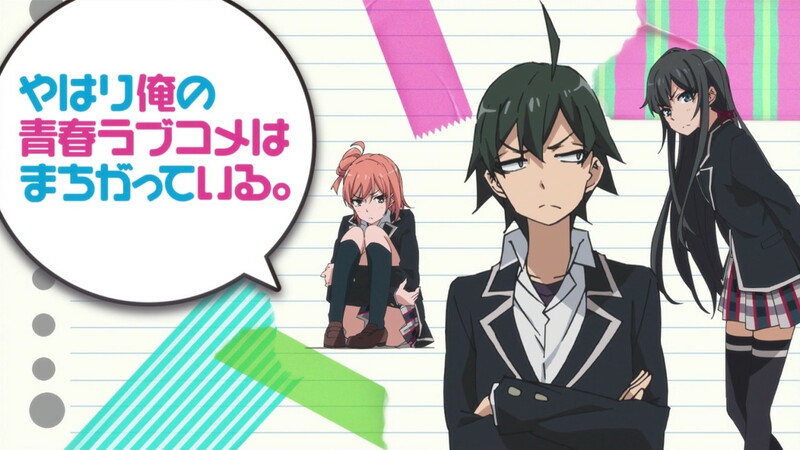 For all intents and purposes, Hachiman Hikigaya is the Holden Caulfield of the anime world. It’s this embodiment of the antisocial mentality that I think a lot of people (myself included) can relate to in some form or another. While Hikigaya most definitely steals the show, there are other very interesting characters that we meet along the way like a helpless otaku-chuunibyou and an irresistible trap character. High school series often get bashed for being cookie-cutter and mundane. Sure, there are no big monsters to fight or evil demons to vanquish, but they can sometimes show that the most sinister demons are the internal ones. The fact there is fear, hatred, and jealousy that naturally exists in the human heart, and that they control much of our actions might be more terrifying than any monster. 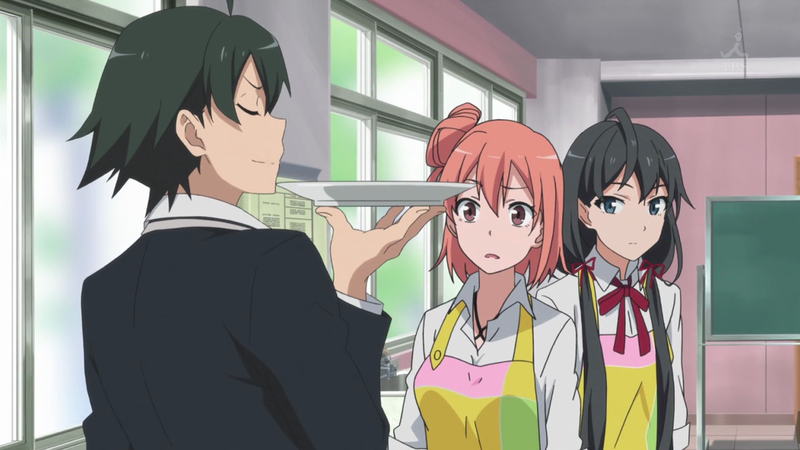 Oregairu shows us that high school can be a battlefield like no other, and the strongest weapons are words and wit. This is how Hikigaya chooses to fight, with verbal assaults on the human psyche. There isn’t much worse for a high school teenager than to have his or her true colors exposed, especially by a nobody like Hikigaya. Of course, this method of warfare doesn’t actually do favors for Hikigaya’s public image really, making him a tragic hero of sorts. Despite all the doom and gloom about the human condition, Oregairu maintains its status as a romcom. Hikigaya’s inner and outer monologues are hilarious to listen to, and banter between him and his intellectual equal Yukino are great. Yui mostly just sits there, not understanding. Some might argue that she’s a useless character in this regard, but I disagree. Yui’s different from Yukino and Hikigaya. She’s much more optimistic and I think it says a lot that she’s able to infiltrate the self-defense walls that they have put up for themselves all their lives. The only problem I really had with Oregairu was the disappointing animation quality. As much as I love Brains Base (my top three favorite series were produced by them), their production quality is incredibly inconsistent. The character designs are great, but the animation just looks very unclean. It makes me wonder what would happen if it were done by any other studio… Though it must be said that I love the OP and the ED. Speaking of other studios, I can’t help but compare Oregairu to SHAFT’s Monogatari series, both of which are heavily driven by dialogue. The relationship between Hikigaya and Yukino is also reminiscent of the one between Araragi and Senjougahara. I might get flak for saying this, but I like to think of Oregairu as Monogatari without the ghosts, pretentious animation, and roundabout conversations. Oregairu is about real people with real problems. Even for people like Hikigaya or Yukino, who think they have the world figured out, have a thing or two to learn from each other and the world outside of their little bubble. The series has a distinct lack of concrete romantic development, though, I guess that’s to be expected with the title that it has. Because of how the characters are, the story works without needing romance, but I definitely wouldn’t mind seeing some in the possible future. With characters like these, romantic elements actually makes things much more interesting. While no 2nd season has been announced as of yet, a PS Vita game is set to be released in September, as well as an spin-off episode. If you wanna watch an intellectual, comedic high school anime series (and aren’t put off by the animation), definitely give Oregairu a chance. Your enjoyment level may vary depending on how much you resent society. Reblogged this on 愛 Kenjii Musings 愛.
I’m also quite disappointed with the animation quality drop. Still crossing my fingers that the spotty animation gets fixed in BD releases–though I have my doubts since Brain’s Base doesn’t usually fix much on their BDs. For anime ss1, I don’t expect about quality in anime so ss1 is fine IMO. My interested points to story and characters. I agree with you about character design is great. Anime songs (OP & ED) are very beautiful in every version. Ps. – Maybe my eyes are blurred but I think I saw “Zaimokuza route” too. I should go to clinic and check my eyes. – Please release this game soon! For LN, While waiting for vol 12 and I guess this vol would be released this year but this is just my guess (in other words, my expectation.). I’m starving but still waiting for this vol.